The memory is singed into my mind, easily remembered though it happened so many years ago. Our family of five was moving from California to Texas, a process that would take eighteen hours of plane trips and car rides. For me, the prospect presented a formidable challenge. Finally, we made it to our destination in Dallas, looking forward to dinner at one of Clay’s favorite restaurants. Assuming there would be something to please every palate, he hoped it would be a treat for the kids and me as well. And then it happened. Just as we all sat down at our table and began to eat, Nathan slid down from his chair to the floor, stretched out to his full little-boy length, and began to scream and yell and throw food. I tried to soothe him and placate him, but he lunged out to strike me. I got to my feet and walked away, leaving my toddler screaming and kicking on the floor. After giving, loving, trying hour after hour (and day after day) to figure out something that would appease this little boy, I had reached what felt like the end of my rope. I walked away, to peruse a beautiful glass case of desserts, pretending I had no connection to the screaming toddler at the table in the corner. And yes, I felt guilty. But at that moment, I honestly had no intention of going back. I had served, loved, held, comforted, run after, placated to the end of my strength. Somehow they would all have to cope without me. Inside, I was thinking, I don’t know what he needs, but he needs something I cannot give right now. There was much trial and error and grace in the years to come. But we came to hold fast what our hearts insisted (at least in quiet moments): that our boy was not a diagnosis. Not a problem to be solved or a disorder to be fixed. He was a child to be guided and trained and gloried in. And Nathan’s differences—yes, even the ones that sometimes exasperated him and us—were, like Nathan himself, also part of the gift he is to the world and to us as his family. Let’s be honest, though; they were also sometimes exhausting! I came to realize early on that if I were to make it through Nathan’s growing-up years, it would take intentionality and creativity—along with lots and lots of prayer. Small pauses throughout my day enabled me to make it from morning to night. A morning quiet time with a candle, a cup of hot coffee, my Bible and a devotional reading of some sort along with my journal and a view out the window helped start each day on the right foot. Meeting a friend for coffee, taking a drive in the mountains or a walk downtown or by the ocean, retreating to a quiet room for some reading time in the afternoons, a yearly getaway for a ladies conference—all of these things helped me survive busy seasons. Good friends are hard to find, but they are so important! Most of my own girlfriends have been gathered when I opened my home and just invited someone over for lunch or tea or asked some ladies to join me to read a book together and talk about it. Don’t give up on good relationships; a listening ear is a wonderful treasure and sometimes, a life-saver! While strict schedules never seemed to work with my outside-the-box children, we did thrive on rhythms we designed for ourselves. We ate breakfast and cleaned up together, usually listening to fun music, every morning before moving into our school days. On Sunday afternoons we’d have a teatime, with favorite treats and something warm to drink along with a readaloud for everyone to enjoy. We looked forward to an overnight family sleepover on the back porch in the summers, fall meant time for an open house when we invited neighbors and friends for cider and cookies or chili, and hosting Christmas teas for my friends and their daughters became a treasured tradition. It’s been said that motherhood is a marathon, and not a sprint—and so it is! “Let us not lose heart in doing good, for in due time we will reap if we do not grow weary” (Galatians 6:9). 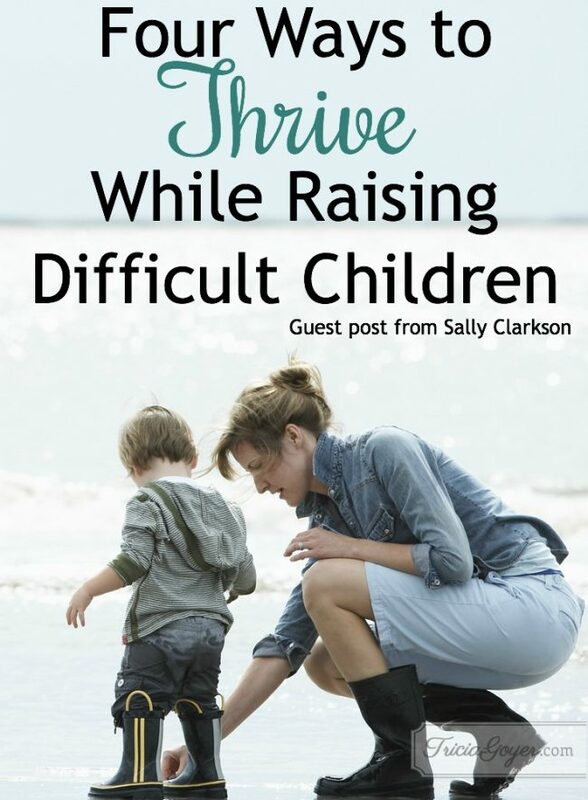 You won’t soon see the fruit of all your difficult labor as a mom. It is a wise woman who pours into her family while keeping in mind her own need for beauty and rest, and especially for being poured into by the Spirit as she goes about the work of motherhood. Sally’s newest book, Different, is available January 24, 2017. Join Sally and Nathan as they share their stories from a personal perspective as mother and son. If you are in need of help and hope in your own journey with an outside-the-box child, or if you’re an adult trying to make sense of your differences, you’ll find deep insight, resonance, and encouragement in the pages of this book. Dare to love and nurture the “different” one in your life. For more information on Sally and Nathan and to download the first chapter, visit the Different website. Order a copy of Different here.